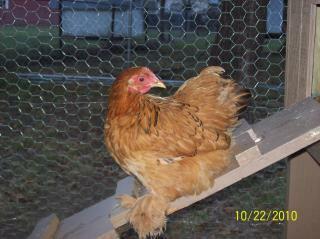 SO, WE FINALLY MADE THE LUNGE AND DECIDED TO JUMP INTO THE EVER GROWING WORLD OF BACKYARD CHICKENS. 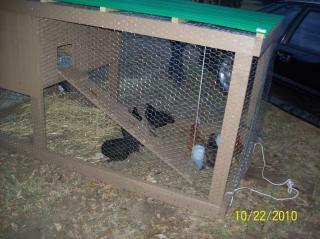 WE HAVE 3 DOGS AND KNEW WE WOULD NEED SOMETHING TO KEEP OUR NEW FEATHERY FRIENDS SAFE FROM THE PUPS. WE DECIDED TO BUILD A TRACTOR FOR A COUPLE OF REASONS. 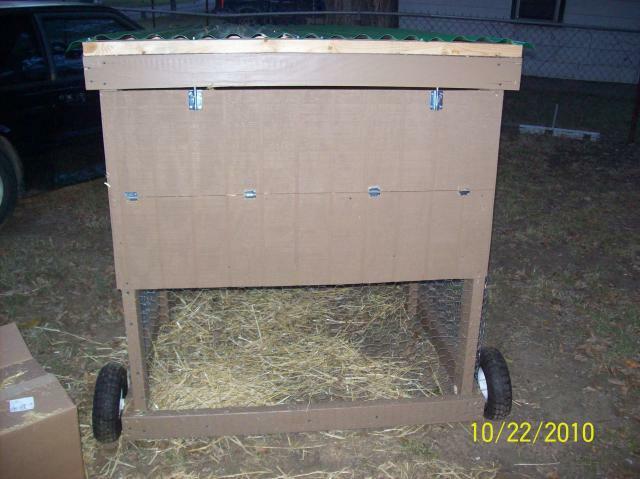 FIRST ITS MOBILE SO WE CAN GIVE THEM NEW FORAGING AREAS, 2ND FAIRLY INEXPENSIVE TO BUILD COMPARED TO A FULL COOP AND RUN, 3RD WE REALLY LIKED THE IDEA OF THEM. SO I STARTED RESEARCHING DIFFERENT LAY OUTS AND GENERAL REQUIREMENTS FOR AREA PER BIRD AND DEVISED A FAIRLY EASY TRACTOR THAT WE HAVE INVESTED ABOUT 175.00 IN. I STARTED BY CUTTING 4 OF THE 2X4S AT 48" MAKING 8 48" LONG 2X4S. THEN CUT 2 OF THEM DOWN TO 43" SO THE WATER WILL RUN OFF TO ONE SIDE. ONCE YOU HAVE THE 2X4S CUT I STARTED AT THE BOTTOM AND SCREWED THE 48" 2X4S TO THE END OF THE LONGER 2X4S MAKING THE TOTAL WIDTH 48"
AFTER SCREWING ALL 4 CORNERS TOGETHER AD THE UPPER LEGS. I OPTED TO PUT THE LONGER ONES NEAR THE COOP END OF THE TRACTOR AND THEN THE WATER WILL RUN AWAY FROM THE EGG DOOR. 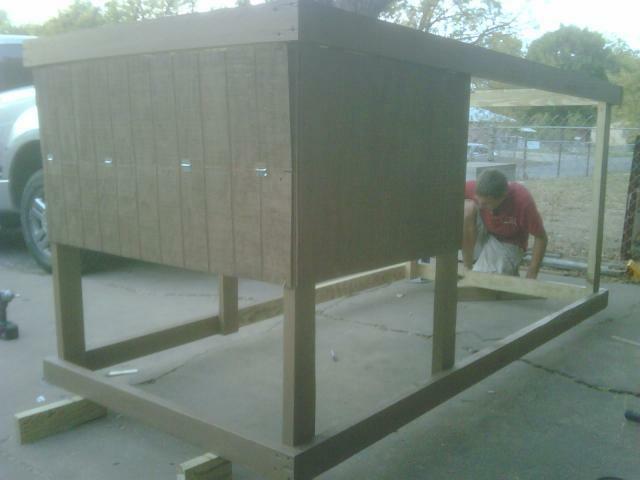 ONCE YOU HAVE THE LEGS ATTACHED YOU CAN HAVE A HELPER HOLD ONE END OF A 2X4 SO YOU CAN ATTACH THE OTHER END. 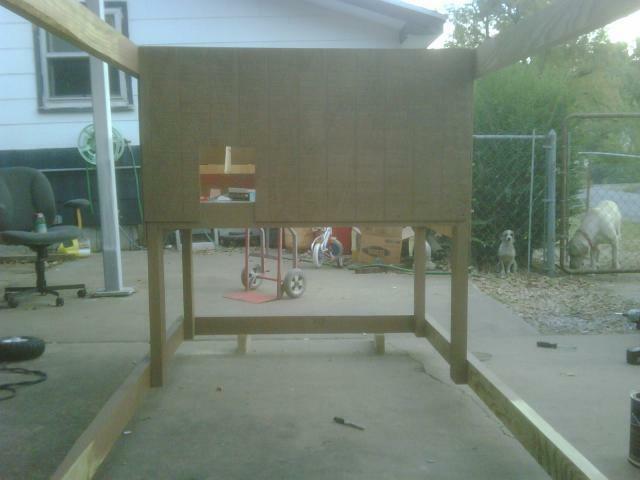 REPEAT ON THE OTHER SIDE, THEN ATTACH THE 2 REMAINING 48" 2X'S TO THE ENDS COPYING THE LAYOUT OF THE BOTTOM. 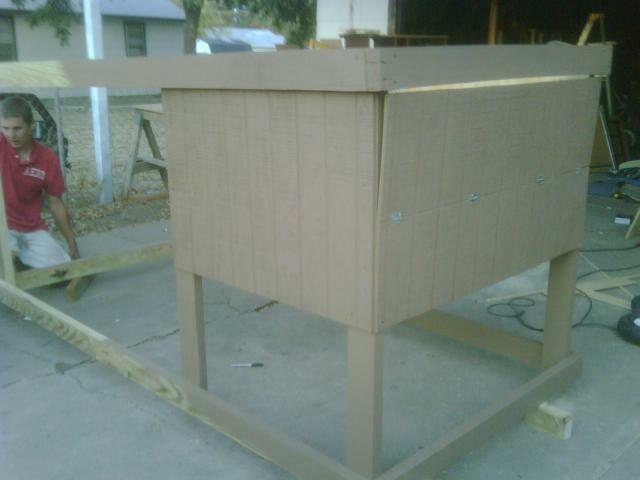 ONCE YOU HAVE DETEMNINED THE SIZE OF THE COOP MEASURE THE DISTANCE BETWEEN THE CORNER AND THE NEW LEGS THAT HAVE BEEN INSTALLED AT THE EDGE OF THE COOP, THEN CUT 2 2X4S AT THAT LENGTH INSTALL AT 23 INCHES BELOW THE TOP 2X4 MAKE SURE THE BOTTOM OF THE 2X4 IS AT 22-24'' BELOW THE TOP IF ITS TOO LOW YOU WONT BE ABLE TO ATTACH THE BOTTOM OF THE SIDING. CONTINUE BY CUTTING THE 2 REMAINING 2X4S TO LENGTH BETWEEN THE REMAINING CORNERS. 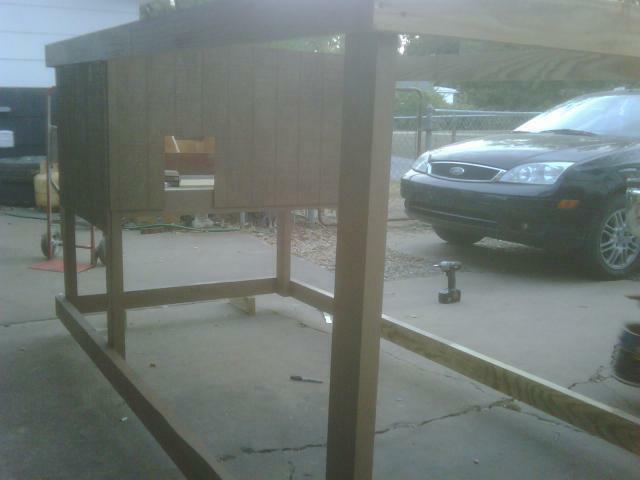 ONCE YOU HAVE ALL THE 2X4S ATTACHED YOU CAN START APPLYING THE SIDING. I CUT ONE OF THEM IN HALF LENGTH WISE TO HAVE 2 12'' X 24'' PIECES TO HAVE A DOOR TO ACCESS THE NESTING BOXES. AFTER I HAD THE SIDING ON I DECIDED TO WRAP THE WHOLE TRACTOR WITH CHICKEN WIRE YOU WAY WANT TO DO THIS BEFORE THE SIDING IS INSTALLED THAT WAY YOU HAVE THE SIDES OF THE COOP EXPOSED LIKE MINE. I HAD TO REMOVE THE 2 SIDES AND TRIM THE WIRE SO THAT IT IS ATTACHED ON THE 2X4S BEHIND THE SIDING. AFTER THE WIRE IS INSTALLED I INSTALLED THE 2X2S ON THE ROOF EVERY 18'' FROM SIDE TO SIDE I WOUND UP CUTTING 3 AT 48'' RESULTING IN 6 48'' PIECES. 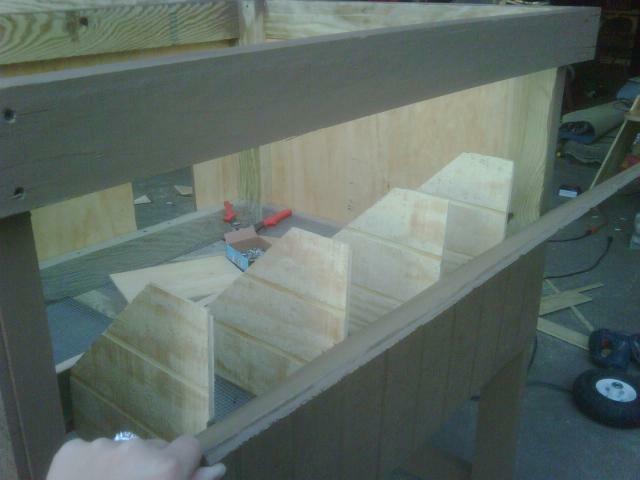 THEN ATTACHED THE ROOFING PANELS WITH THE ROOFING SCREWS. 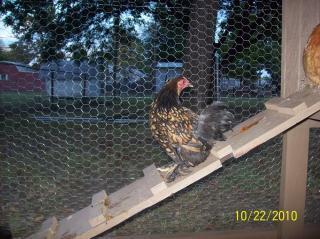 Nice coop, the sloop on the ramp is steep, is there any ventilation? Great design and I like how detailed your instructions are. 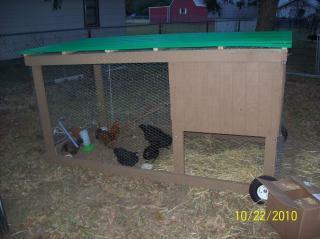 This is a great coop for bantams and can be easily moved. The coop page also contains quite a bit of information as to how it was built. How many chicken can fit in it? What did it cost? 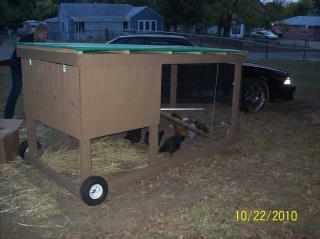 Sorry for all the questions,but I'm trying to find a good design and cheap and big enough for 6-8 chickens. We where originally going to do a hoop house. But we have decided on this system for our new tractor, thanks. What a wonderful job you did explaining step by step. I think we nuns can do this! Thank you for being so precise! I also saw on you tube a guy made cylinder sun roofs out of 2liter plastic pop bottles for more lighting... He made it look easy too. Luckily we have a Sister who is quite handy with her power saws and tools.